Today my guest is the dynamic, Dorena Williamson. 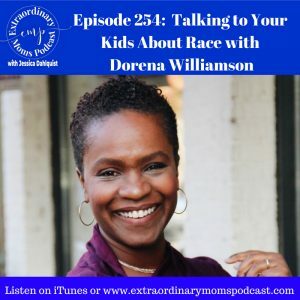 Dorena is a children’s book author and we are covering the topic of talking to your kids about race on today’s episode. I tried to ask all the questions you or I might want to ask, but might be too afraid to ask. I took one for the team. It was a rich conversation that left me feeling so empowered to cover this topic with my kids. And definitely check out her children’s books, including, “ColorFull”, to help broach the topic with your kids. It’s such a beautiful book.